If you love the art of folding and cutting paper, you'll be excited to learn that the Internet is an excellent resource for free Kirigami patterns. Try some of the following free patterns to create something fun. You won't believe all the things you can make with these great designs. These free printable .PDF Kirigami patterns make it easy to learn the basics of this fun paper craft. To download the patterns, click on the image to open the file in a new tab or window, then download or print the pattern. If you need help downloading the patterns, check out these helpful tips. Click here to download this Kirigami pattern. 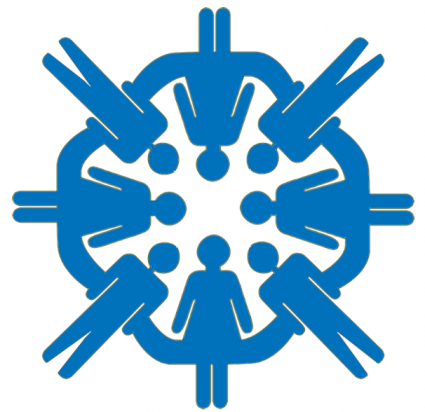 This Kirigami people circle is an adorable twist on the traditional paper snowflake design. Print the pattern in several different colors and arrange your people circles together to make a large decoration that celebrates cultural diversity. If desired, you can draw different outfits on the people using markers, crayons, or colored pencils. 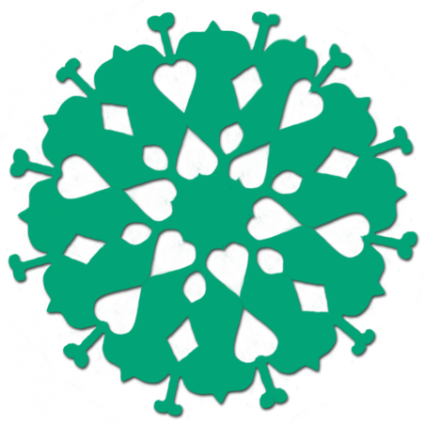 Download this heart snowflake pattern. This snowflake with heart embellishments would be cute as a Valentine's Day party decoration. 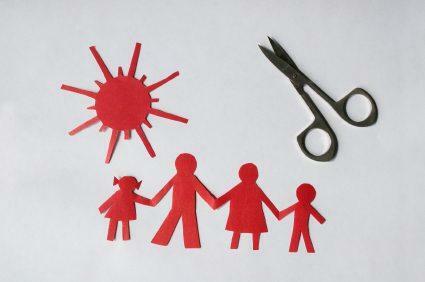 Cut snowflakes from pink and red paper. Brush them with a coat of glitter glue for a little extra sparkle. 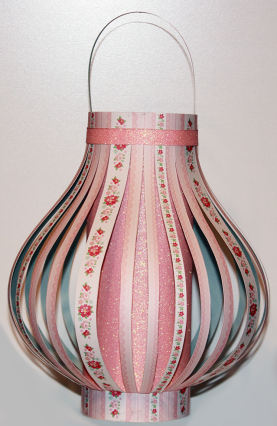 A pink pear shaped lantern is a cute decoration for a baby shower or for a young girl's birthday party. Use a craft knife for accurate cuts. Click to download the round lantern pattern. 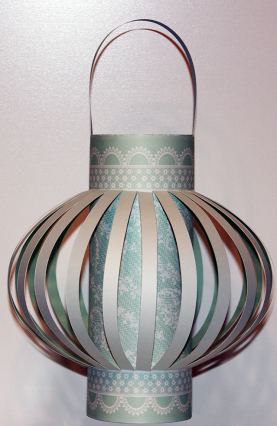 This round turquoise lantern uses a technique similar to the pear shaped pink Kirigami lantern. The lace pattern on the top of the lantern gives it a feminine feel. While origami is an ancient art and has shown up in books for centuries, Kirigami is more recent. It came to the United States in the 1960s and since then it's taken the paper folding world by storm. These days you can find hundreds of Kirigami patterns on the Internet, and many are available free of charge. Origami Resource Center is a favorite site for paper folding enthusiasts. You can browse their small section of links to a variety of Kirigami projects. Greetings with Patterns offers a nice assortment of Kirigami designs by Maria Victoria Garrido. The selection includes dragons, flowers, bells, butterflies, and Valentine's Day greeting card patterns. WonderHowTo features video demonstrations as opposed to written tutorials, which can be especially helpful for those who prefer to learn visually. Yasutomo has an excellent set of instructions for making a Japanese maple leaf using Kirigami. This type of paper folding is perfect for leaf designs, and once you master this one, you may want to create your own. If you're already familiar with paper folding and cutting projects, Kirigami will come naturally. Whether you're a beginner or experienced keep these tips in mind when starting your next project. Choose a flat and firm work surface, such as the top of a sketchpad. Use thin paper whenever possible. Thick paper can be very difficult to cut when it's folded into multiple layers. Read all of the project instructions before you begin. Crease with a bone folder to make neat fold lines. Take care not to skip any steps in the project. If you feel inspired to create your own original Kirigami patterns, check out the selection of featured designs on the Paper Craft Central website. These unique projects are an excellent demonstration of just how creative you can be by making a few cuts in a piece of paper. Kirigami is a great way to express your creativity, and downloading free patterns will help you discover how the different cuts will affect the finished piece. Start off with simple patterns and work your way up to more challenging ones to continue to hone your skills. Once you've mastered these patterns, you can start designing your own.